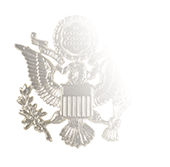 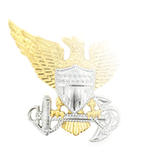 This version of the U.S. Public Health Service Com-missioned Corps collar device was first introduced in 2012 with a mandatory wear date of 1 January 2015 as part of a move by the Corps to bring Mil-Spec conformity to its various forms of insignia, from collar and sleeve devices to cap devices and hard and soft shoulder boards. 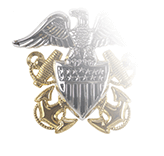 The most notable design changes was in the fouled chain around the anchor, which on the previous was draped over the shank of the anchor to for a U-style shape. 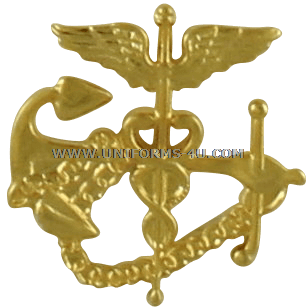 The pin-on metal Corps device, measuring 11/16” x 11/16”, is worn in conjunction with a miniature-size metal rank insignia on the collars of the Khaki Service Uniform. 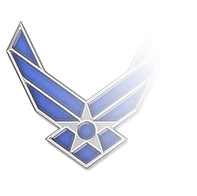 It is centered vertically on an imaginary line equilaterally bisecting the shirt’s collar point (thus equilaterally bisecting the insignia itself, by the way) with the bottom of the caduceus toward the collar point. 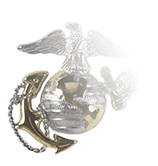 The center of the insignia must be one inch from both the outside and leading collar edge.